Khenchen Jigmé Phuntsok (1933-2004) was an incredibly influential and remarkable tertön. He became one of the most well known teachers in Tibet and was a prominent leader in the revival of Buddhism after the Chinese destruction. In addition to this, he revealed many terma treasures throughout Asia often in front of crowds. He was a devoted and disciplined practitioner and gave his followers an inspiring example of how to diligently develop their capacities. He was born to a nomadic family in the Golok Serta region of Kham in Eastern Tibet. At his birth he displayed various signs of his capacity, including immediately reciting om a ra pa tsa na dhi, the mantra of Mañjuśrī. His recitations of this mantra would total over 13 billion throughout his life. At age five, he was recognized as the reincarnation of Tertön Lerab Lingpa and entered Nubzur Monastery. There he received ordination from Khenpo Sonam Rinchen at age nine. In his early teens he began to reveal various terma treasures and felt intense devotion to the Dzogchen teachings. Praying intensely to Mipham Rinpoche, the great master appeared to Khenchen Jigmé Phuntsok in a vision and granted him the blessing of experiencing the nature of mind at age fifteen. During the next few years, he received teachings and instructions from many masters. From age eighteen to twenty-four, he studied intensively with his main root teacher, Khenchen Thupten Chöphel, at Changma Gar, receiving full ordination from him at age twenty-two. Two years later he was enthroned as the abbot of Nubzur Monastery. In 1959, despite increasing oppression from the People’s Liberation Army, Khenchen Jigmé Phuntsok remained in Eastern Tibet. For the next twenty years, he continuously eluded Chinese authorities and secretly wandered throughout Serta with his sister. He continued to teach and practice Dzogchen meditation along with a few of his closest students. His ability to avoid capture during this time became legendary and his fame continued to spread. During this time Khenchen Jigmé Phuntsok practiced Mipham Rinpoche’s Dzogchen commentary, A Lamp to Dispel Darkness. His practice consisted of reciting a mala of Mipham Rinpoche’s supplication prayer followed by reciting the four sections of the commentary. After completing one hundred supplications and one text recitation, he would start over again. He completed this practice over 100,000 times, totaling 10,000,000 recitations, in addition to doing the preliminaries. It was through this practice that he gained complete recognition of the nature of mind and he demonstrated to his students how one should practice correctly with diligence. In 1980, he began to build earthen retreat huts with a few of his closest disciples in an uninhabited valley that once housed Tertön Dudjom Lingpa’s hermitage around 1880. This was the founding of Larung Gar that has become one of the largest and the most influential Buddhist institutions in the world. 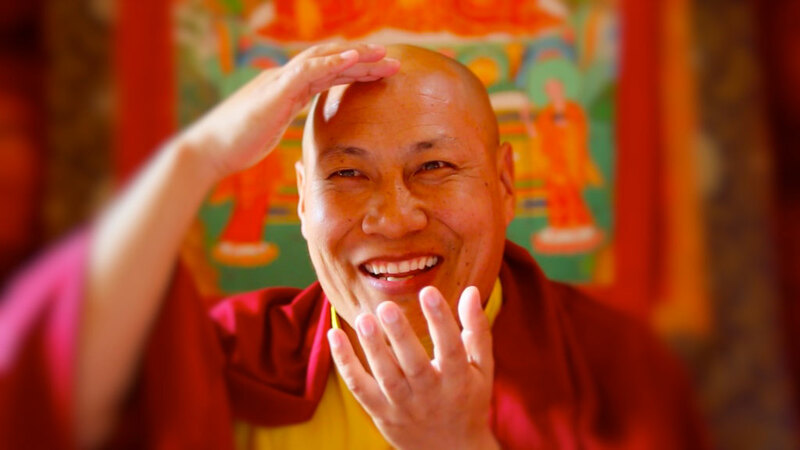 The success of Larung Gar stemmed from Khenchen Jigmé Phuntsok’s incredible capacity as a teacher. He was not only wise and compassionate, but also captivating. People enjoyed his teachings and were inspired by his presence as he always had new things to share from his wealth of experience and visions. Due to his virtue, dedication, and amazing capacity, many thousands of monks and nuns, who maintained monastic discipline according to the Vinaya, along with many students from Mongolia, China, and other countries, arrived at Larung Gar to study with Khenchen Jigmé Phuntsok. Khenchen Jigmé Phuntsok revealing a terma treasure. Throughout this time he continued to reveal terma treasures and to have visions. One miraculous revelation occurred at Larung Gar in front of a crowd of 10,000 monks, nuns, and lay people. Khenchen Jigmé Phuntsok came to the front of the three story main temple with his sister, her daughter, and other lamas. While in view of everyone, he began a graceful, joyous dance. He circled his visibly empty hand three times and on the final round a large, white egg appeared in his hand. Later, he cracked the egg open and within it was a text in ḍākinī language. Each syllable rekindled vast amounts of teachings already present in his wisdom mind. Numerous times he would reveal treasures and tell his disciples to record it as this was the only way to capture his teachings as he would speak so quickly. His students would listen to the recordings afterward and write down everything he had said. In 1987, he went on a famous pilgrimage with thousands of his students to the five-peaked mountain called Wǔtái Shān in China. In a vision of Mañjuśrī, he had been told that this pilgrimage would benefit all beings and Buddhism. He stayed in caves and other sacred places and composed many songs of realization (doha) while there. He gave teachings to many (sometimes with diverse crowds swelling to over 10,000 people) on this trip, including teachings that helped his Chinese followers to make deeper connections to Tibetan Buddhism. At the Panchen Lama Chökyi Gyaltsen’s request, Khenchen Jigmé Phuntsok traveled to Beijing in 1988, and gave teachings from all the major Buddhist traditions at the Buddhist Higher Academy. Thereafter he went on pilgrimage with the Panchen Lama and revealed numerous terma treasures. In 1990, he was requested to travel to India to bestow teachings upon His Holiness the Dalai Lama and Penor Rinpoche. While journeying to India, he revealed many terma treasures left by Guru Rinpoche and Yeshé Tsogyal in Nepal. He had strong connections to Guru Rinpoche, Mipham Rinpoche, and his root teacher Khenchen Thupten Chöphel. These great masters and the dharmapālas repeatedly gave him advice in visions and dreams about the future and how to bring the most benefit to others. He continued to travel extensively, giving teachings and empowerments, until he passed away in Chengdu at age seventy-one on January 6, 2004. In his final testament he asked his disciples not to look for his reincarnation, but to practice as he had taught. Do not lose your own path. Do not disturb others’ minds. After spending fifteen years with Khenchen Padma Tsewang, I was sent to Larung Gar to study under Khenchen Jigmé Phuntsok at his Centre for the Five Traditional Sciences and Higher Buddhist Studies. I studied Buddhist philosophy with other khenpos and received many teachings on mind training. Every morning I had class with different khenpos, followed by two hours of teaching from Khenchen Jigmé Phuntsok. After lunch I attended more classes with teaching assistants and ended the day with evening debates. During the last few years when I was there, I received many Dzogchen teachings directly from Khenchen Jigmé Phuntsok, including special oral instructions. To receive Dzogchen teachings, we had to climb two hours up to the top of a nearby mountain as the great master gave his instructions there. These were the most amazing Dzogchen teachings that I received.